Grew Up... admiring her mother and disdaining the person whom she grudgingly admits is her "father." Maka was once close to her father, but ever since Spirit cheated on her mother, she's been actively determined to follow in her mother’s footsteps and avoid her father's. 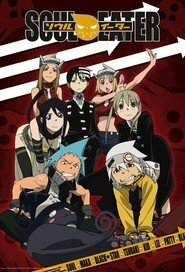 Living... in the Death Weapon Meister Academy, an institution formed to train weapon meisters such as Maka and their weapon partners. Like an ordinary school, the DWMA has homework and tests– but unlike most schools, it also sends its advanced students out on missions to collect the souls of dangerous witches and corrupted souls. After collecting 100 souls, a meister's weapon will become a Death Weapon: a tool powerful enough to be wielded by the school’s headmaster, Death himself. Profession... student and weapon Meister. Maka’s academic abilities are top notch, and she wields her partner, Soul Eater, with incredible precision and agility. She is praised by Death himself as an “excellent Scythe Technician” just like her mother was. Interests... reading, studying, and academics. Maka can get very competitive when it comes to grades, and while she takes all aspects of being a meister seriously, she's best at the written exams. Relationship Status... single. And since her father has convinced Maka “men are worthless,” it’s likely to stay that way. She does have a very close bond with Soul, but they bicker as much as they fight, and Maka's firm on keeping their relationship strictly platonic. Challenge... turning Soul into a Death Scythe that can be used to protect the world from the terrifying beings of madness and evil known as Kishin. In order to do this, Maka and Soul must collect and purify 99 Kishin eggs– human souls that have been corrupted by evil– and one witch soul. It won't be an easy task, but Maka has the skills, the weapon, and the friends to have a good chance at succeeding. Personality... determined and brave, but also plagued by self-doubt. Maka might be an intelligent, studious girl, but she's still prone to insecurities, especially when she feels she's failed her friends. Generally level-headed, she does have her occasional outbursts– but even at her most volatile, Maka's emotions are based on kindness and a deep desire for true friendships. Maka's popularity ranking on CharacTour is #277 out of 5,000+ characters. See our top-ranked characters and read their profiles.